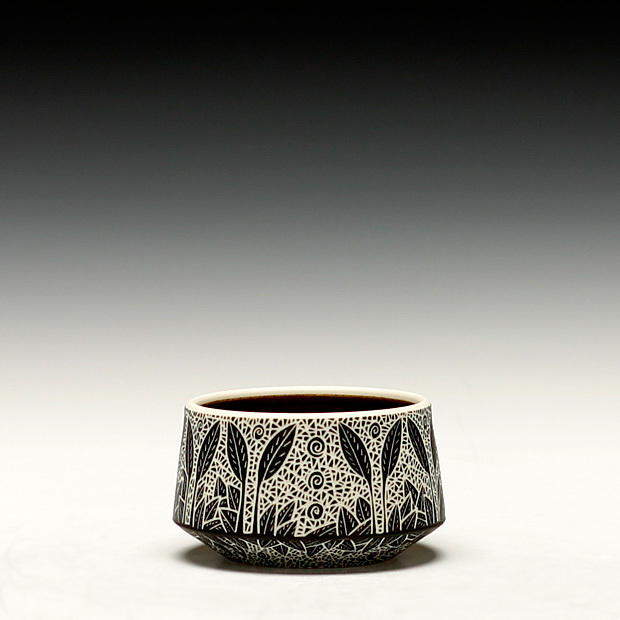 Wheel thrown porcelain with terra sigillata, sgraffito decoration and fired to cone 10 oxidation. 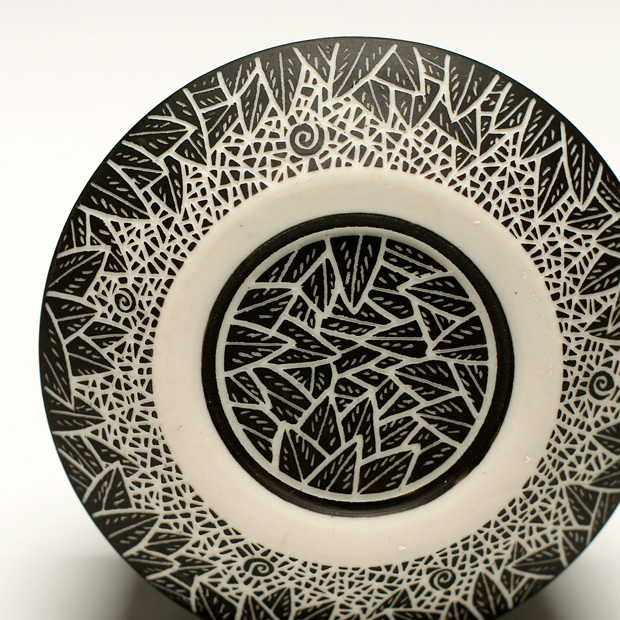 My work uses a centuries old technique called sgraffito to create very intricate patterns and designs. 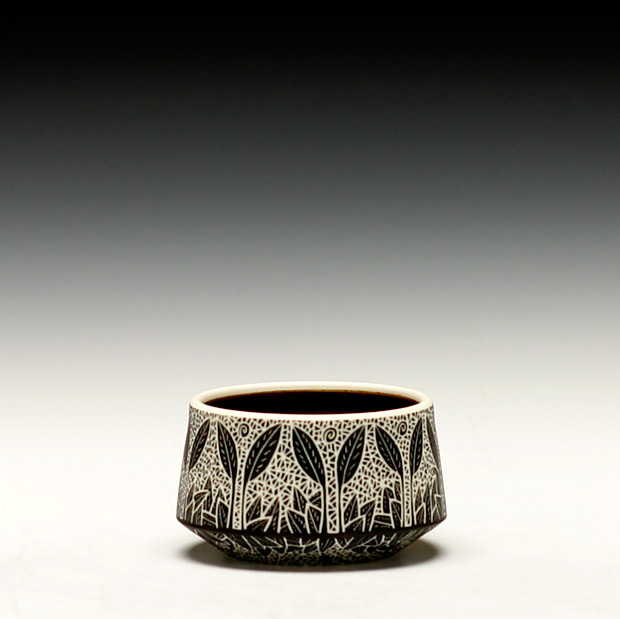 Each piece of hand thrown porcelain is coated with a black terra sigillata slip. I then use a very sharp knife to cut into the slip to expose the white porcelain underneath. This technique allows me to indulge in my passion for design and challenge my skills at the same time. Over the last few years my work has become more personal. A refuge. An expression of beauty, love and grief all at the same time. I have always had a keen interest in ancient civilizations and the incredible art they produced. Those ancient worlds hold endless inspiration for me and always will. But I am now looking inside myself. Searching. Searching for what I have lost. In late April of 2014, Steve my husband, partner in clay and life passed away unexpectedly of an undiagnosed heart condition. This man that I spent over 26 years of my life with was everything to me. He was always my biggest fan but I now know he was also my biggest inspiration. A true artist. An amazing potter. Never have I worked in the studio without him by my side. 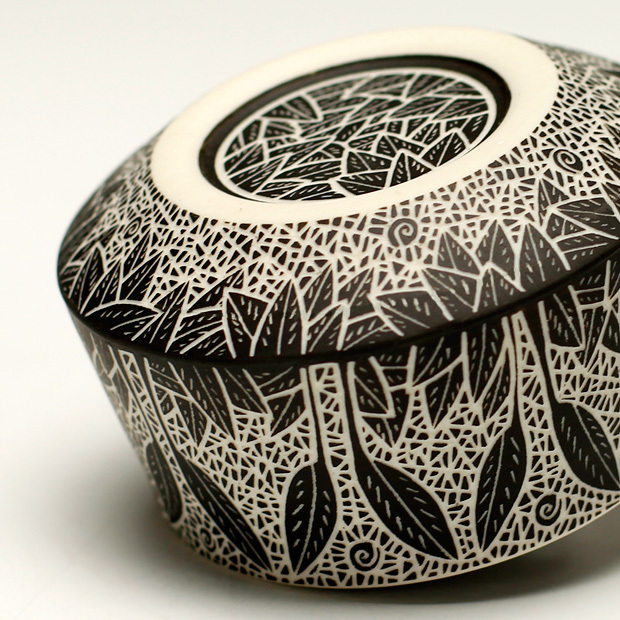 The pots we made together were an expression of the love we had for each other and our work. I cannot help but reflect on what was. It has shaped my life to what it is. Moving forward is inevitable, but in looking back and remembering I am carrying along memories and ideas of all that we had together. Now I must look inside and find the courage and grace to continue what Steve and I started together so long ago. Steve will always be in every piece I make and every piece I decorate. How could it be any other way?